This creamy asparagus and pea soup is so easy to make and delicious served hot or cold! The seasoned baked asparagus gives this soup an incredible depth of flavor! Spring is in the air and I have to say that it is my favorite season of the year. The crocuses starting to poke through the ground, the milder weather, being able to get started on my garden and yes – the price of some of my favorite produce (especially asparagus) starting to fall. I love asparagus. It is seriously one of my favorite vegetables, no matter what…ahem…”after effects” it might have on your bodily functions. Typically, I just make a baked asparagus with by sprinkling some olive oil and salt and pepper, but when I saw this recipe, I knew that I wanted to tweak it (mainly because I am not a vegan and REALLY don't like almond milk). Want a heartier soup? 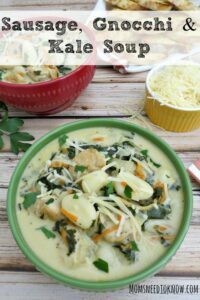 Try this Sausage, Gnocchi and Kale soup! Let me tell you – this asparagus and pea soup is so stinkin' delicious and I would probably be making it every week if it wasn't so decadent. While the asparagus and peas are certainly good for you, the half & half & Parmesan cheese won't be that good for your waistline! Funny thing happened…I made this, ate a bowl of it and set aside the rest to cool before putting it in the refrigerator. When I went to transfer the cooled soup to a storage container, I ended up licking the spoon and this asparagus and pea soup is just as delicious cold as it is hot! That makes this a perfect soup to enjoy even in summer! I used my Blendtec to puree the soup, but that was mainly because I didn't own an immersion blender (although I actually purchased one in the last week). You could also use your food processor to puree your soup. The asparagus gets pretty soft and breaks down pretty easily! As for the croutons, I am a big fan of “use what you have”. I happen to love using Herbs de Provence, but you can easily substitute garlic powder, Italian seasoning, ranch dressing mix or whatever strikes your fancy! 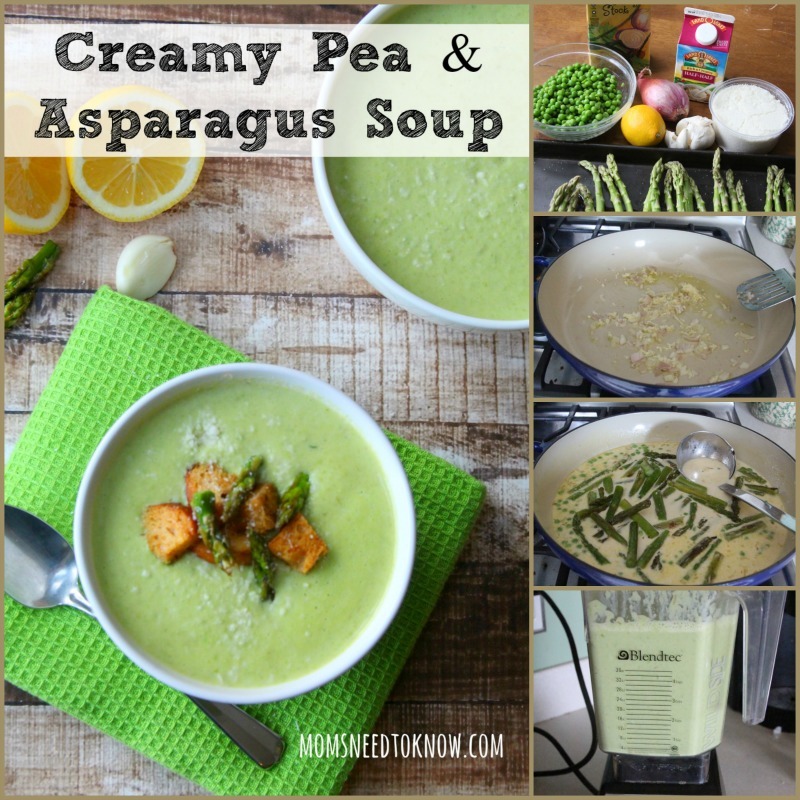 This creamy asparagus and pea soup is so easy to make and delicious served hot or cold! The baked asparagus gives this soup an incredible depth of flavor! Line a baking sheet with foil (to make cleanup easier). Spread the asparagus in a single layer. Drizzle lightly with olive oil and season with salt & pepper. Toss to coat and then return to a single layer. Bake the asparagus for about 12 minutes. In a medium saucepan or pot, heat the 3 tsp of olive oil. Add the garlic and shallots and saute until the shallots are translucent. Do not allow the garlic to brown or it will be bitter. Add peas, chicken stock and half & half and heat for about 5 minutes. Add Parmesan cheese and whisk until blended. Remove from heat and add the lemon juice. Toss the bread cubes with the oil and seasonings. If they look too dry, add some additional oil and spices and toss again. Remove from the oven, toss the cubes a bit and return to the oven for another 10 minutes until crispy. This is so prefect for Easter dinner and throughout the spring. 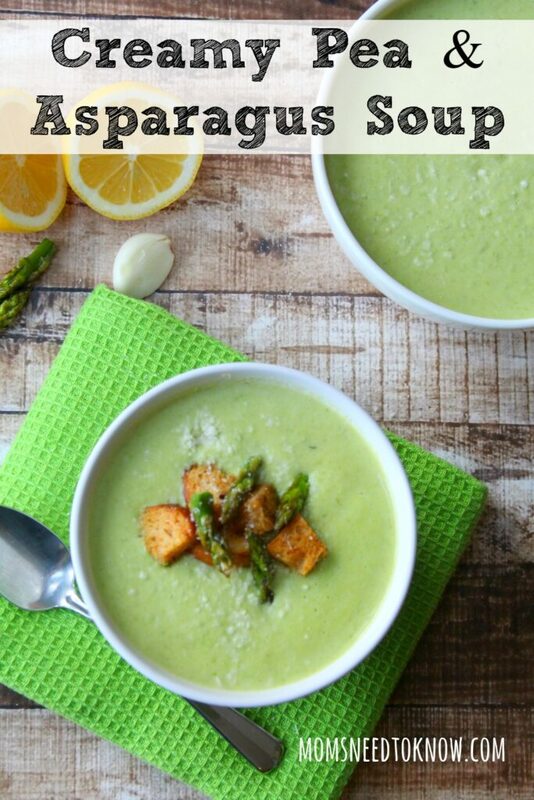 I’m not a huge fan of asparagus, but I would still give this soup a try! Already pinned. Thanks for linking up with Merry Monday this week. I LOVE asparagus but have never tried it in a soup. This looks so good, I’ll have to try it. Pinned! I found you at the What’s Cookin Wednesday link party. My daughter is going to love this recipe. Thanks for sharing with us at Merry Monday. This recipe will also be Featured at Merry Monday this week. Mmmm! This looks so yummy! Thanks for linking up with us at Funtastic Friday!